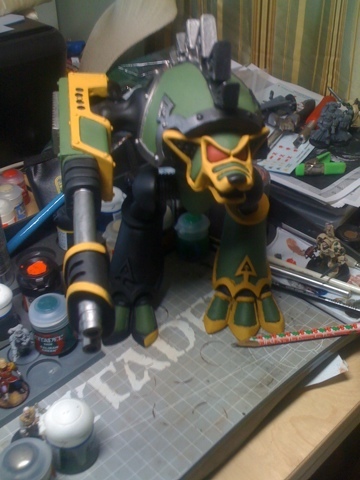 Finally got started working on my warhound! I know I'm suppossed to be working on praetorian command squads but this resin monster was calling me from it's box in the closet! hopefully will have him finished by this weekend and I can start working on other projects. As far as other projects go I have been searching for the old school baret stormtroopers. I need one plasma gunner, one melta gunner and one regular trooper to complete my two squads. I have thought about mixing in the old metal hooded troopers but I think that might hurt the overall look. anyway if you happen across the above listed models and are willing to sell/trade let me know. Looking good! I dig that paint scheme, looking forward to seeing more! Wow! took me a minute to catch the conversion on those troopers Drax. good job. Luckily for me I found a lot on ebay that should contain the specific models I need to complete these squads so we won't have to terrify with my attempted conversions. Thanks for the comment Mordian, I went with the color scheme for legio astromana based of the forgeworld Graia. I figured that since gryphonne has been eaten Graia would be the next most likely to lend titan support to the Praetorian guard!